This seemingly attractive Brewers fan in the yellow shirt looks to have season tickets first row just to the left of home plate. The cast of characters around her is always changing which makes it look like she goes by herself. She usually can been seen in a tube or tank top and also appears to keep score during the game. With Brewers poised to make the post season it's very possible she could be front and center during prime time in October. Is that enough to call upon the I-Team to discover more about this lonely comely Brewers lass? OK. We don't know the answer. After all, we are chain-smoking, post-ironic, bearded, tight-tee-shirt-wearing effete New Yorkers who cannot appreciate a good hurricane or a good woman. We are not from Milwaukee. But you might be, in which case you'd have an answer. 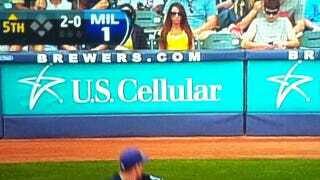 You know that girl behind home plate ("yellow-shirt girl" or whatever moniker you guys use)? I'm pretty sure she just called in to the post-game show on 1250 AM...At least by the way the hosts were talking, mentioning how she's always on TV and acting like horndogs...lol. They referred to her as "Front-Row Amy." Apparently, she has had season tickets for three years, and comes to the games (about 40 per year) herself. She was in the third row the past few years, but was able to move up to the first row this year. She also commutes from Oshkosh for the games...and the clincher as far as convincing me that this is "our girl," she said that likes to be there alone, so she "can focus on the game and keep score." I went up and talked to her after the game tonight and she said she has one single season ticket. She drives from Oshkosh, and it would normally take her about an hour and a half to get to the game. Now with the construction she said it takes about two hours. We cannot confirm this, of course, as these dispatches come from Brewers fans on a message board. (Those are two suspicious practices.) I-Team, do you know more about this lady? Are you, in fact, this lady? If so, you know where to direct your correspondence. UPDATE: Apparently, Front-Row Amy is Amy Williams. She is on Twitter, where she describes herself as "the most passionate Brewers fan you will ever meet." She also says there that she loves to dance and work out. Go make friends!